There is often much discussion when it comes to the topic of lifting children on a motorcycle, with many opinions being flashed back and forth. It’s because of this, and because of a little incident that I was personally involved in (which I will use as an example later) that I have decided to do some research of my own into this topic and try to dispel any myths and guesswork. Please note, the content of this article is a personally formed opinion from the information available to me, and from personal experience. I hope to provide some best practices and make it safer for all on the road. I am not doing this to open debate but feel free to comment on any points I make. Firstly, let’s take a look at what the K53 rules say with respect to the duties related to a motorcycle. “Duties relating to motor cycle, motor tricycle or motor quadracycle"
No person shall drive a motor cycle, motor tricycle or motor quadracycle on a public road unless his or her feet are resting on the front foot-rests suitable for the purpose and, where the design of such motor cycle, motor tricycle or motor quadracycle makes it possible to do so, he or she is seated astride on the saddle of such motor cycle, motor tricycle or motor quadracycle. No person shall on a public road carry a passenger on a motor cycle unless such cycle has an engine with a cylinder capacity exceeding 50 cubic centimetres and unless such passenger is seated in a side-car or astride on a pillion attached to such cycle and, in such latter event, the feet of the passenger are resting on foot- rests suitable for that purpose. Subject to these provisions, not more than two persons shall ride upon a motor cycle on a public road, excluding a person riding in a side-car attached to such motor cycle. Not more than two adult persons shall be carried in a side-car attached to a motor cycle on a public road. No person or animal or object shall be carried on a motor cycle, motor tricycle or motor quadracycle on a public road in front of the driver thereof: Provided that an object of a non-bulky nature may be so carried if securely attached to the motor cycle, motor tricycle or motor quadracycle or placed in a suitable carrier fitted thereon for that purpose and carried in such a way as not to obstruct the driver's view or prevent his or her exercising complete control over such motor cycle, motor tricycle or motor quadracycle. Only Ride yourself on a public road is you can comfortably reach the foot pegs. Only Pillion someone who’s feet can comfortable reach the foot Pegs. Legally that is about it, you and your passenger must be able to have your feet reach the relevant foot pegs, and from my research there are no other restrictions apart from all people using a motorcycle must wear a helmet and you need to have a license. This is what the law has to say, just on a side note, take a look at point 5, you may not transport items in front of the rider unless in a tank bag. And so says the law, this leads me to the next thing, even though the law is very simple and does not put a lot of restriction on, I’d like to take this time to encourage anyone who plans to pillion a child to be aware of some of the things I’m about to discuss, it could save not only your child’s life but yours at the same time. The “Belt” or child strap, this device attaches the child to the rider so that he/she is not at risk of accidentally falling off while riding, sounds pretty simple and useful. I do however have a few concerns with this device, in the Think Bike (www.thinkbike.co.za) circles they banter around the phrase, “Dress for the fall and not the ride”. So if you are 101% sure, guaranteed that you will NOT have to execute emergency landing techniques then this device would be pretty good. However if you should come down, I would suggest that it’s far better for the child, if he or she is free to be thrown away from the accident (as they are lighter) and would sustain less injuries if flying solo than if they are rolling about attached to you, a far heavier and more solid structure. School physics is a good resource to call on when doing the math around these options. So I’d rather say if the child is not able to support themselves on the back of the bike then don’t pillion them. Educating them around bike savvy topics is a far better approach. The “Handle” or love handles is also a better device, it consists of a strap with handles on each side of the rider that the child can hold onto. Again the child would need bike savvy and discipline to not let go unless in an accident and in my books if they don’t have the discipline to keep hold they are not ready to pillion. The “Seat”, has recently been launched on the market, I had a quick look at one such devices and I must admit I’m impressed. It’s similar to a child’s car seat that straps into the pillion seat; it also has its own adjustable foot peg mechanism. The only worry I have is this model has a looped belt foot strap. I would prefer an open ended Foot peg, as I’m a bit concerted that the child’s foot could get caught in the one I reviewed. or as the Think Bike people say ATGATT (All The Gear All The Time). I should probably have put this up first but in my books this is not a discussion point, so I wanted to get the others out of the way first! I realise that kiddies gear is very expensive and yes even in my books very often the vendors take the opportunity to make a quick buck out of you in this regard, that’s a fact of life – BUT even so I highly recommend, heck I insist – No Gear No Ride! This I cannot stress enough, and the example I’ll use later which is a personal experience my son and I had the unfortunate honour of enduring will indicate. Let’s explore this minimum list. Helmet: Please make sure it fits properly, always ask advice and if the child complains it’s tight during the fitting exercise all the better. Jacket: I personally feel that leather can be a bit heavy, making longer riding a discomfort thus the child will get restless, so I prefer good quality Air flow type jacket, with armour pads in shoulders, arm, chest and back area at least. But leather is always cool for the kids. My son is begging for a leather jacket. Pants: These are very hard to get for the road, but there are plenty MX pants, however please ensure that they have armour in the right places and if need be go double layer. I insist that my kids wear a comfortable track suit pants under their riding pants if not a proper road pants. Yes it gets warn, but it saves skin. (If the decent people who make easy overs are reading this, please, easy overs would be the best option.) Sorry standard jeans just won’t qualify. Gloves: you can get pretty decent kiddies gloves at a good price and in some pretty fancy designs and colours, so you should not have any issues here, I prefer gloves with solid knuckle protection myself. 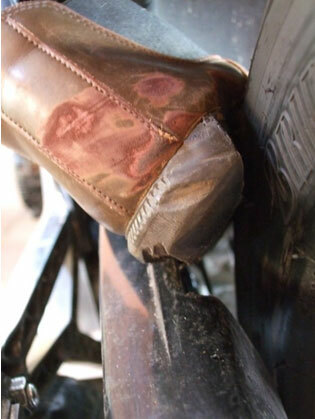 Boots: This is another difficult item to get hold off, but as you will see later please get decent boots, I insist that my children have toughened leather boots (as in the case of my son) or proper riding boots, even light MX boots can work. Bike vendors typically design bikes for adult use, and gaps are more than often designed to prevent adult’s body parts from getting in where they shouldn’t, as you will see in the example, a child’s body parts like feet are a lot smaller and can get in where they shouldn’t. Here I would suggest you review you bike and find a way to close off such gaps, like using a wheel hugger on the back wheel. Again this might be a little confusing to most, the law says I have to have a full license, which I have and the pillion, they are just sitting there, so cool. Here I strongly recommend you keep the following in mind: You will also see a good example of this in the example later. A child when faced with uncertainty, pain can often panic far quicker than the educated rider. When a child panics his/her actions tend to become unpredictable and uncontrolled. Reasoning with such an individual can be challenging while riding a bike. In the example later, I was forced to bring the bike to a standstill without my clutch hand. Not because my son panicked (of which I am most grateful) but because of physical forced acting upon him. Spend some time looking at your bike with your child sitting on it and think through what skills you should be practicing to be able to handle you bike in difficult situations where you child might need you attention at the same time as you may need to manoeuvre your bike to safety. Breaking and handling is also different when riding with a pillion so please take note of this before taking on a passenger. 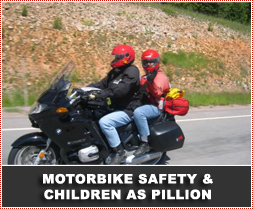 Pillion Education is a must, if your pillion, young or old is not up to speed around certain basics they will become a danger to the rider and themselves, and they are a risk item. Please spend some time educating them on what you expect of them. After a most eventful toy run, it was time to head home; we kitted up and headed out. Now my 6 year old son loves riding pillion and has had many lectures about the correct gear and how to behave on the back of a bike. We were cruising on the freeway doing around 100 km/h as we were happy and in no rush. Our turn off was coming up and I prepared to swing to the correct lane to take the off ramp in the near future. Suddenly my son shrieked in my ear, I knew it was serious because I was deafened though my helmet and he also had his full face on. Next he pounded me on the back of my shoulder Stop, Stop, daddy STOP!! Suddenly his body pulled to the left of the bike as if he was getting off. Stay on the Bike I yelled and grabbed him with my left hand. A quick look and I saw a spot I could safely stop about 100 meters on, this required manoeuvring through the traffic, and brining the bike safely to the stop with no clutch hand as I needed to help keep him on the bike! Thanks to the Skills training we managed to stop safely, if not a bit rattled, safely none the less. The following pic is a mock up of what I saw, naturally we were in no state to take pics at the time. To the right, the Tyre was wearing though the sole off the boot, and the left in his attempt to get free the chain guard had shifted and the chain was eating into the boot. A few things to note here: if my son was not bike savvy he might well have panicked and tried to get off the bike.Thankfully in this case he tried his best to communicate his problem to me and stay on the bike. The chain pulling at his foot made this difficult requiring me to have to help. 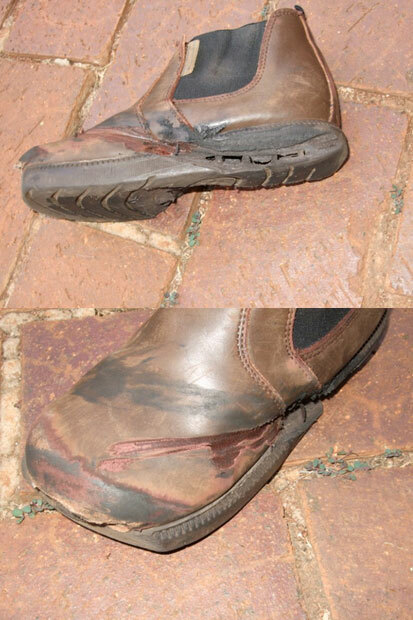 The hard rubber and leather of his boot prevented the tyre and chain from “Grabbing” his shoe/foot, imagine if he had been wearing tekkies or slops? Again here I am grateful for our 1st Aid training as I knew exactly what was needed and what to do. Once patched up we were fortunate to have a Good Samaritan with a car that helped transport him to a nearby hospital. 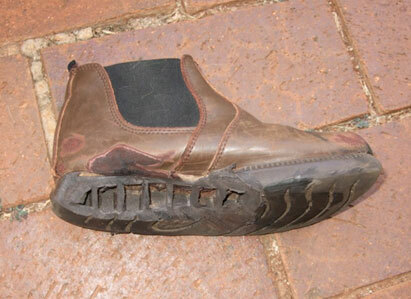 So having seen the boot I know you imagining how bad his injuries were. Severe burn and soft tissue damage to toe area where the chain rubbed against the boot! !